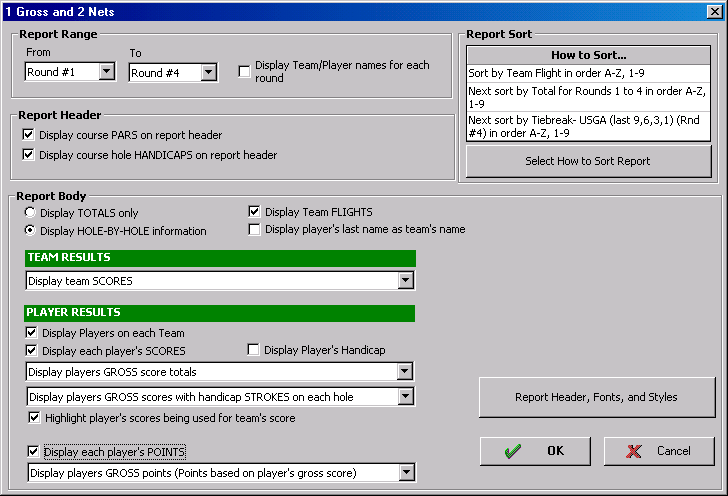 Custom team results lets you specify exactly which scores from which players will be used on which holes. 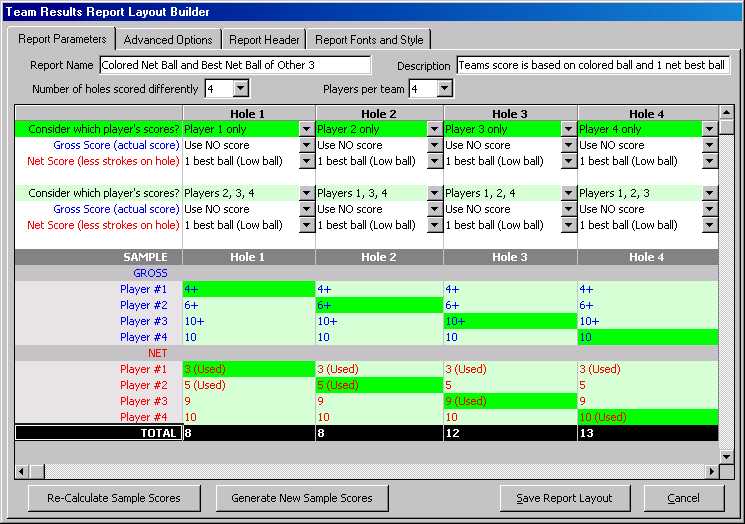 This allows you to build practically any type of team results report in which a golfer plays his/her own ball. The number of types of team reports you can build is literally infinite. Also includes building multi-round team results. Standings can be based on scores (gross and net) or even points. To display, edit, create, or delete a custom team results report, pull down the Reports menu and select Custom-Tournament Team Results-ADVANCED. To view a report - Double-click the report or click the Display Report button. To edit a report - Click the Edit button. To create a new report - Click the New button. To delete a report - Click the Delete button. Several sample reports have already been designed to give you an idea of what can be done. (1 Gross and 1 Net Best Ball) – Team’s score is based on 1 gross best ball and 1 net best ball from each hole. (AC Net Best Ball and BD Net Best Ball) – Team’s score is the total of player 1 and 3's net best ball and player 2 and 4's net best ball. (Low Net Ball and High Net Ball) – Team’s score is based on low net ball and high net ball on each hole. (Net Best Ball Mix) – Team’s score is based on 1 net best ball from holes 1 to 9, 2 net best balls for holes 10 to 17, and 3 net best balls for hole 18. (Pros Ball and Amateurs Gross Best Ball) –Team’s score is based on the pro's score (player 1 on the team) and the 1 gross best ball of the 3 amateurs. (Odd holes only) – Team’s score is based on scores only on odd holes. These are just samples of what can be done. You have the option of setting up different criteria on 90 different holes! That’s different criteria for each hole of a five-round tournament. The possibilities are endless. Report Name: Enter the name of your report. Description: Enter a sentence that describes your new report. Number of holes scored differently: Select the number of holes that will be scored differently. For example, if all holes are scored the same, select 1. If you are setting up a report where holes 1, 2, and 3 are scored differently and the pattern repeats, select 3. If your results have the front 9 scored differently than the back 9, select 18. Players per team: Number of players that will be on a team. You then have the option of selecting which player’s scores are used on each hole. Consider which player’s scores? : Select which player's scores will be looked at. All players, no players, or any group of players. You will notice two Consider which player’s scores. This lets you select different golfers for different scoring options. For example, if you wanted to use player’s 1 and 2 best ball and player’s 3 and 4 best ball you would select the first Consider which player’s score? to ”Players 1, 2” and the second Consider which player’s score? to “Players 3, 4”. Under each hole is a sample showing how the hole will be scored. Click the Generate New Sample Scores button at any time to see a new set of sample scores and how the hole would be scored with the parameters you have set. Example: You want team results to be based on a colored ball and 1 net best ball of other three players. Each player alternates playing the colored ball on each hole. Player 1 plays colored ball first, player 2 plays colored ball on next hole, etc... Above sample screen shows the setup for this. Example: You want team results based on...best 3 net balls on first hole, best 2 net balls on second hole, best 1 net ball on the third hole. This pattern repeats for the remaining holes. Below is the setup for this. If you are selecting both gross and net scores on the same hole, you should instruct TM on how to handle which balls it can select. This instructs TM that it must use a different ball(s) when selecting gross and net balls. If you select this option you need to further select the order in which balls are selected. Gross First – The gross ball(s) will always be selected first, then the net balls(s) will be selected. Net First - The net ball(s) will always be selected first, then the gross balls(s) will be selected. Best Combo – If selecting gross ball(s) first gives the team the best score on the hole, then that will be done. Otherwise selecting net ball(s) first will be used. This instructs TM that it is allowed to use the same ball(s) for both the gross score and net score. 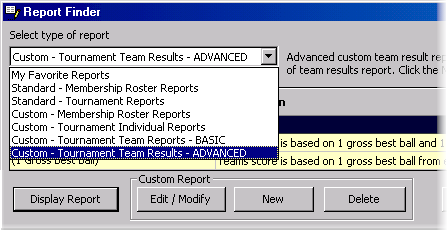 When you select to display a Custom Team Results Report, the following option screen displays. You have complete control of what information appears on the report. Report Range - Report on any range of rounds. Up to 90 holes for a 5 round tournament. Report Header and Body - You have complete control of what appears on the report’s header and body. Option to display pars, hole handicaps, totals, hole-by-hole details, team flights, team results (scores and/or points), team positions, itemized player info, player’s results (scores and/or points), how strokes are applied, team positions, etc. You even have the option to “highlight” which player’s scores were selected to form the team score. Feel free to check any options and see how the report will be displayed.